Overextension is a game mechanic modeling the issues caused by rapid expansion. Each non-core province, with the exception of colonies, causes overextension equal to province development. For example, a province with a development of 24 will add 24% overextension regardless of how big the state is. 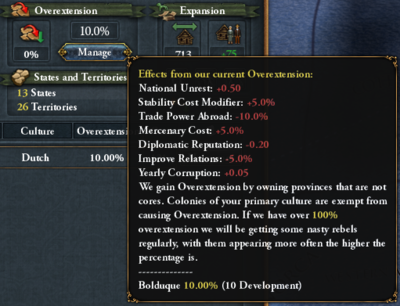 Note that overextension has no cap; it can potentially go far beyond 100% and its penalties will continue to increase. In addition, the AI will view overextended countries more negatively, and will be more likely to either declare war itself, or form a coalition against that country. Various nasty events will trigger, doing things such as lowering stability or hurting trade. The base frequency is one bad event per year, with the time decreasing with higher overextension. Members of the Holy Roman Empire will be reluctant to support reforms while the Holy Roman Emperor is overextended. These penalties combined can really destabilize a country. It is advised not to go above 100% overextension as the severity of the risks rises dramatically. Note that a country will only accept buying a province if they have a core on the province, or it has the same culture group and religion. They also should not be overextended themselves. Administrative efficiency directly reduces core creation and diplo-annexation costs. It also reduces the impact of province development on overextension and warscore cost, allowing for much larger territories to be conquered at once. A custom nation can have a national idea of up to +10% administrative efficiency. This page was last edited on 23 November 2018, at 17:17.